A couple of years ago, my husband, Scott, asked me to make a potato salad. He’s not a man who asks very often for something so specific, 95% of his requests center around the one-syllable, “meat” so I took his request pretty seriously. I’ve always considered potato salad one of those “filler sides” that come with your lunch order at a deli – it’s cheap, easy to make and generally all taste the same. The gloppy, mayo-heavy version that comes in a plastic tub is nothing to brag about, nothing to complain about, it’s just there next to your sandwich. So I set out to make a version of potato salad that would be show-stopping memorable and that I actually could brag about. The first step was to do away with boiled potatoes, which have very little taste (except when mashed with loads of butter and drenched in gravy — but that’s an entirely different recipe), and instead roast them, which gave them a deeper, nuttier taste and a crisp-brown crust on the sides. I definitely wanted to pair them with loads of warm chopped bacon, this was going to be a potato salad served warm with salty bacon that had just come from the skillet. Instead of mayonnaise, I went lighter and made a tangy vinaigrette out of red wine vinegar, mustard and the bacon drippings. Toss it all together at the last minute, right before serving. Bingo! It was all sorts of perfect, my husband had thirds of the warm potato salad and nearly forgot about the “meat” on his plate. So much for the salad being merely a side, it’s been one of my most requested dishes by my family and friends. You know you’ve got a winner when people rotate their dinner plates so that the warm potato salad stands closest, right in front. 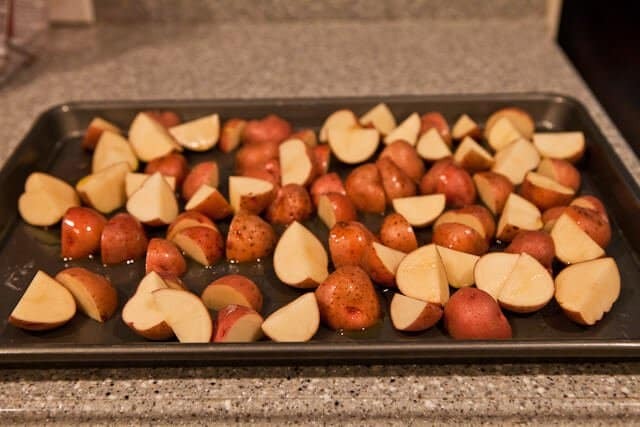 Toss the potatoes with olive oil then spread them onto a baking sheet, making sure they are all in one layer. Then roast, in the oven, for about 25 minutes. When done, the potatoes should be golden brown and a fork or knife will be able to pierce them easily. Over medium heat, add bacon and cook for about 2 minutes. Then, add in the garlic and red onion. Saute for another few minutes until the bacon is nice and crisp. Now, make the vinaigrette. 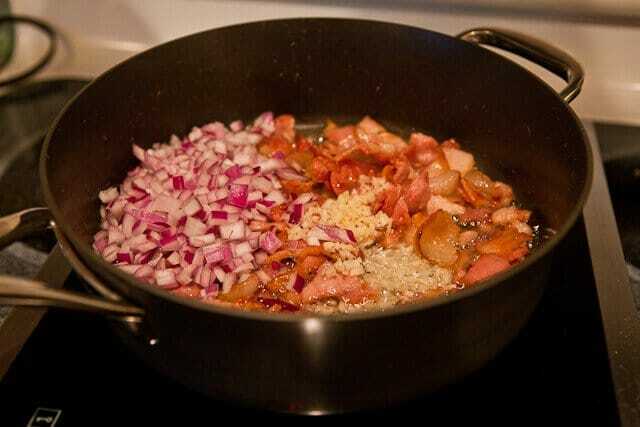 Whisk together the vinegar, mustard, salt and pepper, and then add the bacon, onions and garlic, including all the drippings. Toss the vinaigrette with the roasted potatoes and a few green onions and serve warm. 1. Preheat the oven to 375F. 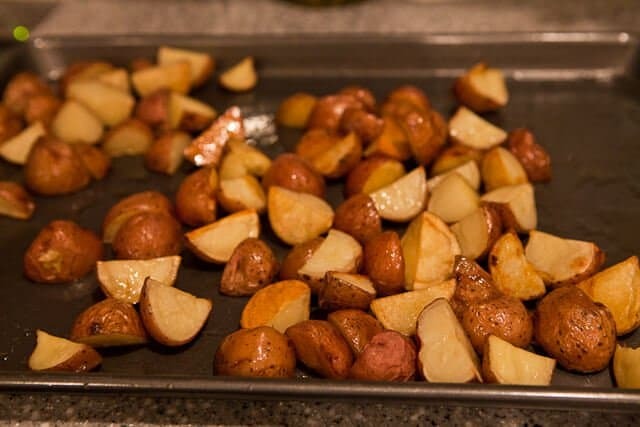 On a baking sheet, toss the potatoes with the olive oil. Roast for 25 minutes or until tip of knife pierces potato easily. 2. Heat a skillet on medium heat. Add the bacon and cook for 2 minutes. Then add in the garlic and the red onion. Saute for an additional 3 minutes until the bacon is crisp. 3. In a large bowl, whisk together the red wine vinegar, mustard, salt and pepper. 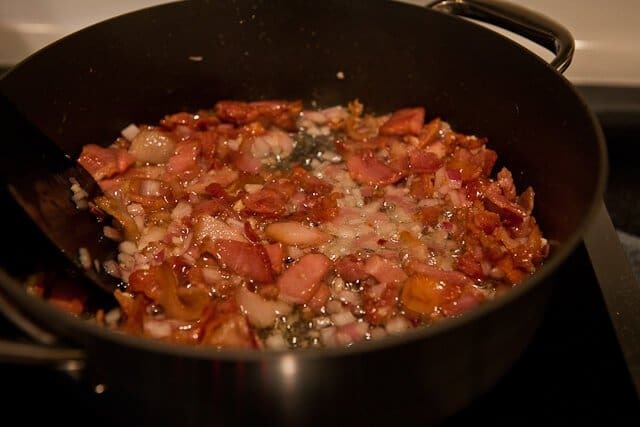 Stir in the bacon, garlic and onions, including all of the bacon drippings. Add in the roasted potatoes and the green onions. Toss gently and serve immediately. I just made this for the first time, substituting butternut squash for the potatoes- making it a low carb alternative dish. Delicious! Great way to do it! I use Balsamic and then top with chopped fresh mint! Totally delicious! We had this with simple baked salmon and steamed broccoli and it was totally up to being the star of the show. Good work!! You should try warm German Potato Salad, a little different than yours, but is really great. Pingback: Summer of Salads, let’s talk potato… | Who Eats Like This? Can’t wait to try this. I used to get hot potato salad in Germany and this looks so close. I just made this and I have to say- it was amazing! It’s a huge hit with the family, even my 3 year old niece LOVES it! And she doesn’t ever eat anything other than pp&j!! I had this exact same thought in mind so went searching for a “warm potato salad with bacon” recipe. You’ve convinced me it’s the perfect thing to add to my Easter brunch. Thanks! I’ve tried this. And it was so easy! Instead of the stated vinaigrette, I have used balsamic vinegar, and it tasted great! Hello Jaden!This recepie looks so delicious and i think it will be perfect for our son,he dosen`t normally like potatoes,so i will give this one a try!and btw i really like your photos! You had me at bacon. Seriously. I’m easy like that. If you have any left over could you just eat it cold or warm it back up? Yummy I’d love some please! we love german potato salad at my house, but never use roasted potatoes, seems like a great idea. This looks so good and easy. Great idea. I love this type of potatoes. taters and bacon? i’m sold! This looks delicious and cheap. 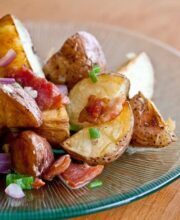 Bacon and potatoes are a stellar combination! Wow!! the potatoes look so good. so simple to make and so comforting and delicious it turned out. I’ll definitely make the potato salad fr my family come this sunday. This looks great! 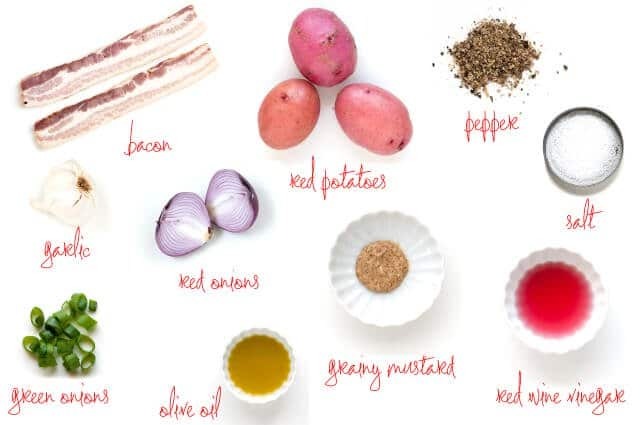 I do not really like potato salads with lots of mayonnaise, so this is definitely a recipe I am going to try! The only thing that could make this salad better would be a fried egg with an runny yolk. YUM! 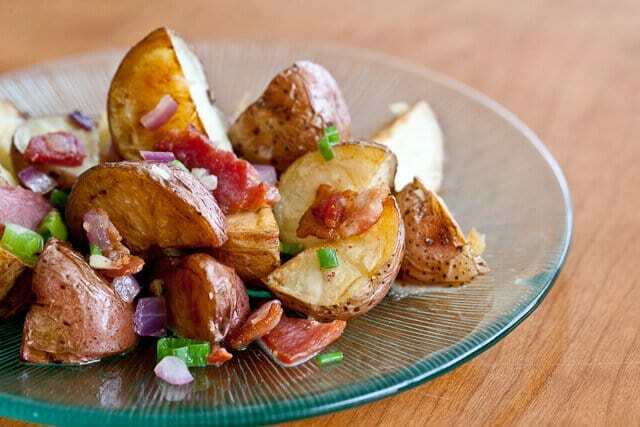 This is my kind of potato salad roasted with bacon. You cannot go wrong! Hope that you had a great time in Nashville! we had this for dinner. it’s sooooooooo good!!! I used the lower sodium bacon and I drained all the fat. Thank you! I love potato salads, is one of my favorite and this idea sound so delicious, thanks for sharing! easy to make and very very tasty. thumbs up! Saving this one to try right now. I have a warm bacon/honey vinaigrette that we love for green salads but I never through about using it like this. Excellent idea. It was a pleasure meeting you and Scott this weekend. You guys (the whole team) inspired and educated me. Thanks! I make something similar but I add crumbled blue cheese to the hot potatoes which creates a tangy creaminess. Sounds like a potato salad my family might love! thx!! Hope your knee feels better soon!! Looks so good! I love potato salads in any form so I must try!! Oh wow! This is going to be a new family favorite. Served at brunch with a quiche and you’ve got a great new twist on eggs, bacon & hash browns. Quite a clever recipe! Kim please share your southwest potato salad! Oh Jaden, I love potato salad this way! 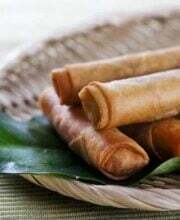 Warm and filling. As an Asian, I’ve always had sides that were “warm”, whether a soup or vegetable. This is perfect for the colder days of fall. Thanks for sharing! Have fun in TN ! Wish I were closer! Looks like a nice alternative to German Potato Salad. I’ll definitely be trying this one! Gonna try this… Love it.. :).. Thank you..
Yum! I’m a huge fan of potatoes. Yours look wonderful! Something tells me this will be a favorite of my hubby as well! Thanks for the awesome recipe! Yum! I can’t wait to try this. Thanks for sharing. OMG, Jaden…this has my name written all over it! 🙂 I have never been a fan of potato salads with mayo. 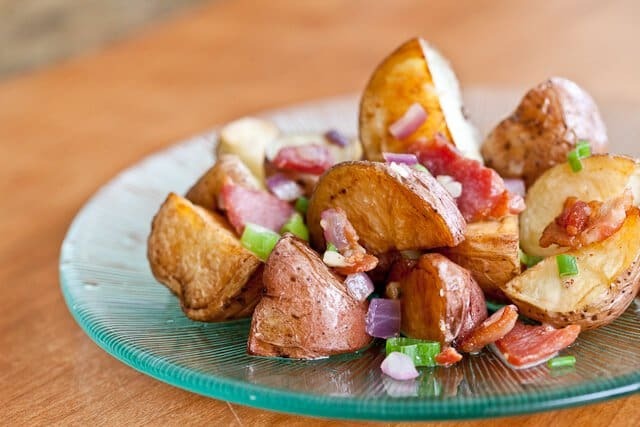 I make a grilled potato salad with Southwest flavors (chipotles in adobo, cilantro and vinaigrette) that I just love, but your potato salad with bacon? HEAVEN! I am going to make this on Saturday. Thanks for sharing! Oh my goodness, this looks out of this world DELICIOUS! I always love making salads with bacon, and this is going to the top of my list to try. Thanks for sharing!